The Bible opens with two creation narratives. The first speaks of the world: "in the beginning God created the heaven and the earth" (Genesis, 1:1); the second, of humankind: "The Lord God formed man from the dust of the earth, and breathed into him the breath of life, and man became a living being" (Genesis, 2:7). From its beginning, Judaism was preoccupied with man and with the world about him, seeing, God in the heavens above and in the heart of man. Four illustrated Hebrew books on science attest to this continuing interest in the world without, and four kabbalistic manuscripts speak of the world within. Religious needs mandated interest in astronomy. Because the Jewish calendar is lunisolar, the months being reckoned by the moon and the year by the sun, astronomical expertise is required to make the necessary adjustments. Indeed, there is a long tradition of religious authorities, including the Babylonian Amora, Samuel and Maimonides, being well-versed in astronomy. Of his astronomical knowledge Samuel said, "The paths of the heavens are as clear to me, as the paths of [his native city] Nehardea" (Berakhot 58b). Maimonides devotes a section of his Mishneh Torah to what he lists as a positive commandment: "to know how to determine which is the first day of each month of the year." To help an individual fulfill the commandments, "the young servant of the Exalted Heavenly Father, Eliezer the son of Jacob Belin Ashkenazi," prepared a handbook in 1722, Sefer Ebronot (Book of Intercalations), which proved useful and popular and of which many manuscript copies were made. In print it went through four editions from 1614 to 1720. The fifth, published in Offenbach, is a particularly beautiful edition with fine illustrations and volvelles for calculations. 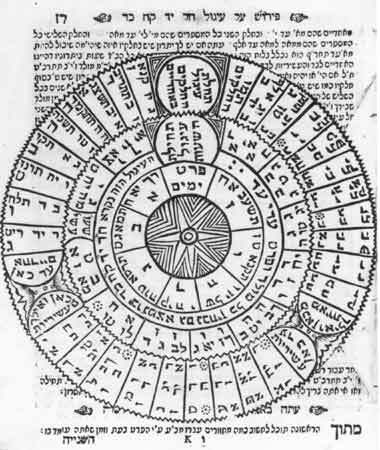 This edition (the fifth) of Eliezer ben Jacob Belin's Sefer Ebronot, published in Offenbach in 1722, is noted for its astronomical -mathematical charts and illustrations. Notable among these are the circular chart and the multilayered paper volvelles. Eliezer ben Jacob Belin, Sefer Ebronot, Offenbach, 1722. Hebraic Section. 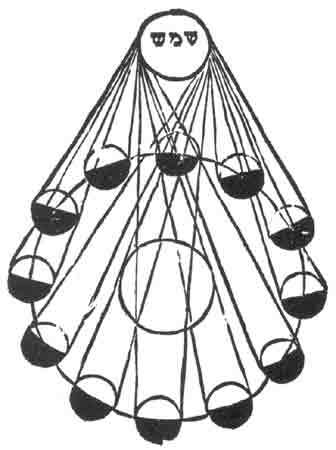 Sefer Ebronot was a brief handbook for one small area of astronomical calculation. Nehmad ve-Naim (Delightful and Pleasant), Jessnitz, 1743, by David Gans (1541-1613) was an astronomical and mathematical work aimed at a comprehensive presentation of the subject. Gans had studied rabbinics with two of the foremost Jewish scholars of the sixteenth century, Rabbis Moses Isserles of Cracow and Judah Loew of Prague. in Prague, in pursuit of his scientific studies, he met two of the leading astronomers of that age, Tycho Brahe and Johannes Kepler. Gans was the author of Zemah David (Offspring of David), a chronicle of Jewish and general history, first published in Prague in 1592, which was republished a number of times in its original Hebrew as well as in Yiddish, Latin, and German. The purpose of Gans's work was, in part, to provide his coreligionists with a history of their people in the context of world history and also, apparently, to impress the world that Jewish history did not end with the destruction of the Temple or the birth of Christianity. Similar reasons evidently motivated him to write his work on astronomy, in part to provide the latest scientific knowledge to his people but also as an expression of Jewish pride. In his Introduction, Gans argues that astronomy was already known to Abraham, who transmitted it to his son Isaac, and he, in turn, to his son Jacob. Jacob and his sons taught it to the Egyptians, from whom the Greeks derived their knowledge of astronomy and mathematics. "The essense of this wisdom," Gans asserted, "first emerged among the sons of the Jewish People." If Christians in the Renaissance were unearthing their cultural heritage why should not Jews proclaim that Israel too was the source not only of religious knowledge but of scientific knowledge as well. Why else were a Latin translation of the Introduction and a synopsis of the volume's contents in that language appended to the volume? From astronomer and chronicler David Gans's book on astronomy. David Gans, Nehmad Ve-Naim (Delightful and Pleasant), Jessnitz, 1743. Hebraic Section. Joseph Delmedigo (1591-1655), physically and spiritually restless, was born in Candia, Crete, and studied medicine at the University of Padua and astronomy under Galileo. In his pursuit of knowledge he traveled to Cairo and Constantinople; and in pursuit of a livelihood to Poland, Amsterdam, Frankfort, and Prague, engaging in the study not only of science but also of Kabbalah. A prolific writer, though most of his works are known only through his own lists of his writings, Delmedigo, in response to requests by Karaites, to whose faith he seems to have been attracted, wrote a book on mechanics. His magnum opus, Sefer Elim (The Book of Elim), was published in a richly illustrated edition by Menasseh ben Israel, Amsterdam, 1629, where Delmedigo was then serving as a rabbi. Elim was the oasis where during the Exodus the Children of Israel camped after encountering the bitter waters of Marah, an oasis of twelve springs and seventy palm trees. The book Elim contains twelve scientific expositions and seventy mathematical paradoxes. Philosopher, scientist, physician, Joseph Delmedigo's book of science, Sefer Elim, is replete with astronomical and mathematical illustrations. 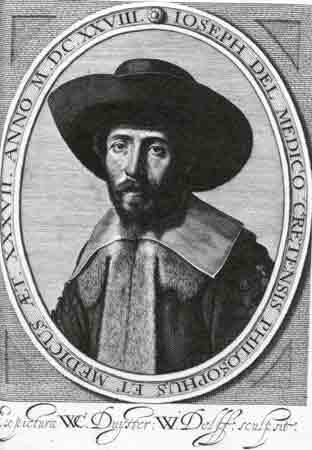 Of special interest and importance is the portrait of the author, a native of Crete, engraved in 1628 in Amsterdam when he was thirty-seven years old. The engraving by W. Delff is from a portrait by W. C. Duyster. Joseph Delmedigo, Sefer Elim (The Book of Elim), Amsterdam, 1629. Hebraic Section. Restless spirit that he was, Delmedigo was critical of the Kabbalah, of the restrictive nature of Jewish learning, and of the scant attention paid to science in Jewish studies; but he grudgingly acknowledged that there were Jewish giants of the spirit, men like Saadiah Gaon, Abraham bar Hiyyah, Abraham Ibn Ezra, Isaac Israeli, Moses Almosino, and David Gans, among others, who through their scientific endeavors "made a great contribution to the house of Israel." Delmedigo's impressive tombstone can still be seen in Prague's historic Jewish cemetery, not far from the more modest stone of David Gans. The book Elim provides a finer monument, its frontispiece an artistic engraving of its author, face weary with wisdom but curious eyes still in quest of more knowledge. Written in Adrianople, where Cohen was physician to five successive sultans, his Ma'aseh Tuviyyah (The Work of Tobias), Venice, 1707, is a miniencyclopedia on astronomy, medicine, hygiene, botany, and cosmography and theology. There are sections on Shabbetai Zvi, an essay on the four elements, and a Hebrew-Latin-Turkish medical dictionary. Ma'aseh Tuviyyah, a popular book on science by the much traveled physician Tobias Cohen, contains sections on astronomy, geography, physiology, pharmacology, and medicine. Of the many fine illustrations which fill the volume, none is more striking than this full-page engraving (below) of the human body compared to a house in the function of its parts and organs. "The eyes are the windows, the nose the aperture to the attic," etc. Tobias Cohn, Ma'aseh Tuviyyah (The Work of Tobias), Venice, 1707. Hebraic Section. Notable for its splendid illustrations, it has an engraved portrait of the author on the verso of the title page, charts of the heavens and the internal organs, and an astrolabe. 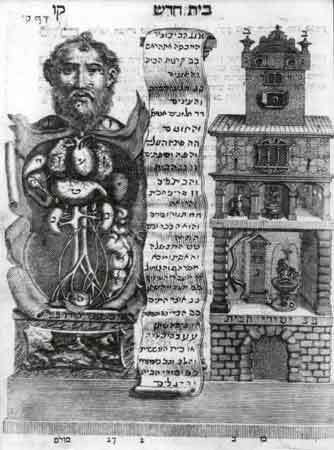 Most striking is the full-page engraving comparing the human body to a house: the head is a superstructure on the roof, the eyes are windows; the mouth, an open lattice; the shoulders, a lower roof, the lungs, a ventilated balcony; the heart, a pump; the stomach, a boiling couldron. Cohn's volume ties man to the world about him. It also fortifies claims to the antiquity of Jewish scientific interest and knowledge. His works and those of Gans and Delmedigo reflect the accepted division of the sciences into their various major components, but one also finds in them a unity imposed by the Creator and sustained by His continuing interest in His creation.